As you can see the guidelines are hard but you have to work for what you want. I will be posting challenge friendly workouts and recipes on my new instagram(@thehautebunny) so I suggest following. And on my twitter(@hautebunnie) I will be posting my daily intake. 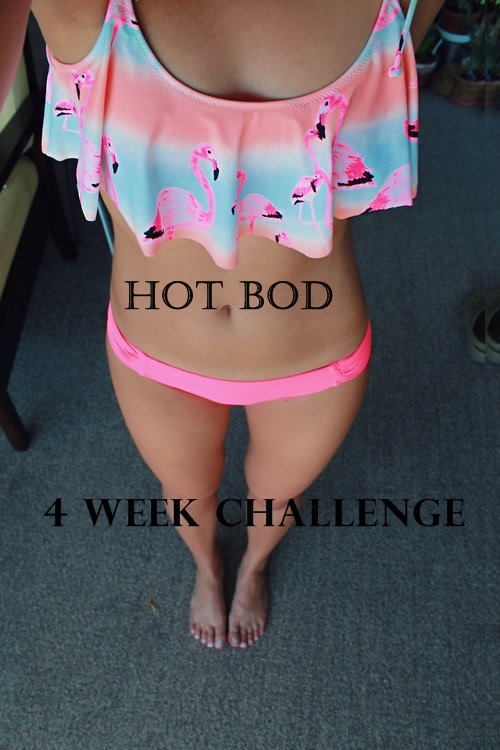 If you post anything about the challenge please tag it #hotbod4challenge so I can see. (You might just see your post on my blog in the future) I will do a weekly update post each week that will have a new challenge. This week’s challenge is to create a daily affirmation such “I am beautiful”. It doesn’t have to be those words exactly but I do want you all to tell yourselves how wonderful you are each and everyday. Post your affirmation on twitter or instagram and tag it! The more creative, the more points! PS. This challenge has a prize! I will be giving away a $15 itunes gift card to the highest participating player(the more posts you tag, the higher chance you have of winning). It will also be based on a short response to how the challenge helped you on the final post for the 4 week challenge on June 29. I will be using random.org to help me choose. To win you also have to be following my blog, instagram and twitter. So get tagging and posting!! Are you guys excited to start? What is your daily affirmation? Mine is “I am amazing and no can tell me different”. So excited to do this!! Going to try to follow all of the rules! Late response but good luck! Ready to start tomorrow!! Thank you for the added inspiration! Sorry for the late response but good luck! When you say cardio 6x do you mean through out a week? Same with the 100g of carbs? Cardio is 6x throughout the week and you have 100g of carbs per day.